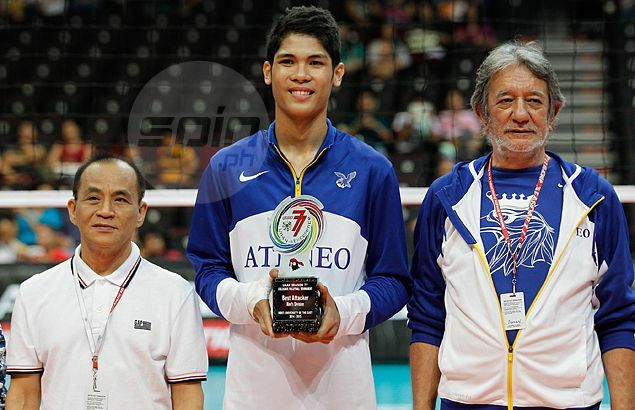 REIGNING back-to-back UAAP MVP Marck Espejo heads the list of the Philippine men’s volleyball team that will see action in the 2015 Southeast Asian Games in Singapore. Espejo joins current and former Ateneo players Rex Intal, Ysrael Marasigan, Izzy Polvoroza, and Timmy Sto. Tomas in the national team coached by Oliver Almadro of the Blue Eagles. Also part of the men’s team are Season 76 Finals MVP Peter Torres of National University, Alnakran Abdilla, Mark Gil Alfafara, Edward Camposano, John Vic de Guzman, and Sandy Montero. The Filipino spikers have been drawn with Thailand, which won the gold medal in the last SEA Games against Indonesia, in Group A, along with Malaysia and Myanmar following the drawing of lots in Singapore. Indonesia and Vietnam, the silver and bronze medalist, respectively, in the last SEA Games, are in Group B together with host Singapore and Cambodia. After four editions, the Philippines is back in the men’s volleyball competition of the SEA Games. The Filipinos finished with the bronze medal when the team last played in the biennial meet in 2005 in Bacolod City.